On Thrursday April the 4, Alberta's fourth ever record of a Brambling appeared at a feeder in the vicinity of Pincher Creek. Somehow I did not notice the report until Saturday and at that point I was already in Medicine Hat for the weekend. I quickly realized that my only chance for the bird would be the upcoming Tuesday, so I called up my friend Chris Do quickly made plans to go out early Tuesday morning. On Monday afternoon I called up the homeowners and asked if I could come chase the bird and, disaster struck! They weren't going to be home, and apparently the bird doesn't like to show up if people are out in the yard. There was a glimmer of hope though as they said they might be back in the afternoon. Even though I had two final exams on Wednesday I wasn't willing to give up on the bird. Tuesday morning came and Chris and I decided to drive to Waterton for the morning and make our way up to the Brambling site later on in the day. On the way to Waterton there were multiple raptors flying about, Golden Eagle, Red-tailed Hawk, Rough-legged Hawk and Balled Eagle were all tallied up in short succession, but the real highlight of the drive for me was a male Barrow's Goldeneye on a pond near Mountain View. This was my first sighting of the species this year. Once we reached Waterton we stopped at the park gate to see what was around. Song Sparrows and Red-winged Blackbirds were singing making it very clear that spring had arrived. After that, we headed straight for the feeder on Fern Street but bird activity was limited. There were a few Steller's Jays, Black-billed Magpies, and American Crows around scaring away anything that wanted to come in and feed. Eventually we picked up both Black-capped and Mountain Chickadee, Red-breasted Nuthatch, Dark-eyed Junco, and Pine Siskin. Unfortunately, my target birds, Evening Grosbeak, Cassin's Finch, and Gray-crowned Rosy-Finch, were no where to be found. We took an uneventful drive up Cameron Lake Road and returned to the feeder an hour later. Not much had changed, but just as I was about to give up I though I heard what I thought was the call of an Evening Grosbeak! I started scanning the trees with my bins and sure enough, there were two male grosbeaks hiding in a spruce. This was a life bird for me. I had tried for them multiple times, but my timing was always off. After about half hour of waiting Chris got a bit bored and decided to take a drive and photograph some of the nearby raptors. I sat and waited. 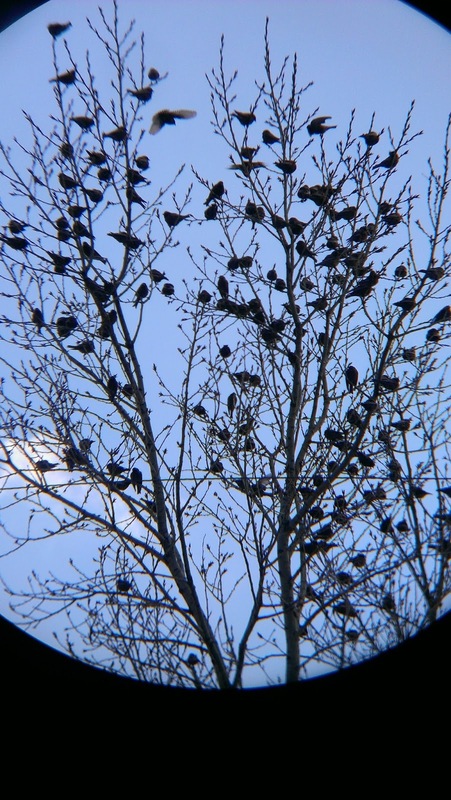 Out of nowhere a flock of over 200 Rosy-Finches landed in a tree above the feeder! Even if I didn't find the Brambling, the trip would have been worth it for this moment. Luckily I did see the Brambling! About 10 minutes after the Rosy-Finches arrived I heard the homeowner yell from inside the house "It's there!". But it flew off before I got my eyes on it. It showed up a few minutes later and allowed me to watch it for eat under the feeder before it flew off again. Unfortunately, Chris was still gone and didn't get to see the bird. Along with him was the camera... I didn't even think to digiscope it as I was just so thrilled to be watching a bird that has no reason to be in North America at all. After the bird left I went inside and thanked the homeowners for their hospitality as they poured me a cup of coffee. We chatted for quite some time before Chris finally returned, but It was getting late and I still had two finals to prepare for! I thanked them again and jumped in my Jeep and headed back to Lethbridge. So I didn't get out birding as much as I hoped to this weekend mostly because I had cousins come to visit that I haven't seen in a year and a half, but I did still manage to add a few birds to my year list. On Thursday afternoon I headed from Lethbridge back home to Redcliff and made a coupe quick stops along the way. At Fincastle lake all of the common ducks were present; good numbers of Mallards, Northern Shovelers, Northern Pintails, Green-winged Teal, Common Goldeneye, American Wigeon etc. were all there along with the usual Canada Geese and a few Tundra Swans. Underneath the large man-made heron nesting structure there were hundreds of gulls which as far as I could tell consisted of California Gulls and Ring-billed Gulls. There easily could have been a few Herrings in the mix, but most were too far off to ID with my binoculars. Just before leaving I decided to try one more time to find a heron or cormorant underneath the structure and sure enough, with a little patience I found 2 Double-crested Cormorants! 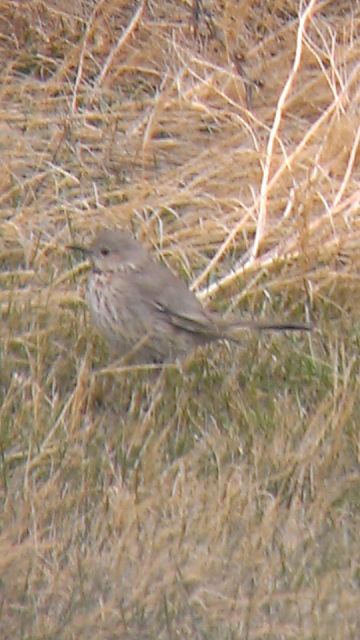 According to eBird they are the first for the province this year. A quick stop at Murray Lake yielded many of the same species with the highlight being my fourth Western Meadowlark of the year. At home the bird feeders were very quiet with only one Common Redpoll visiting all weekend. Friday and Saturday were basically birdless as I was spending time catching up with family. On Sunday, my brother Curtis, his girlfriend Taylor, my mom, and I went out to the Cypress Hills for a drift triking excursion (if you don't know what that is, look it up on youtube). I had ulterior motive as I was hoping to add Mountain Bluebird to my year list. Curtis pointed out the first bluebird on Eagle Butte Road south of Medicine Hat and we quickly added 8 more on Jackpot Road along with a Northern Shrike and a Red-tailed Hawk. 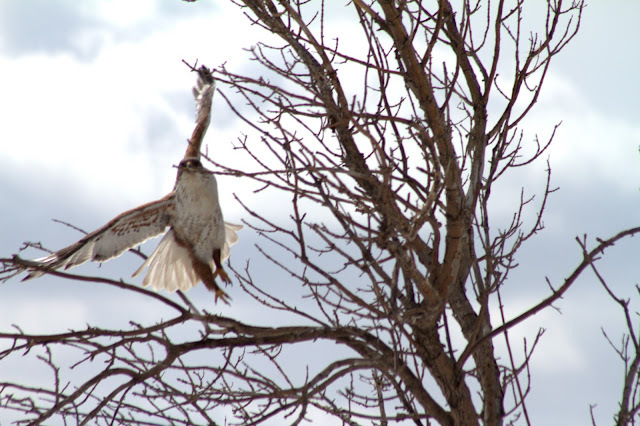 We found a second Red-tailed Hawk, this time a dark morph, at the Reesor Lake outlook and a pair of Ruffed Grouse walked across the road in front of us at Spruce Coulee. There were few other birds around and after spending a couple hours looking for and finally finding Taylor's phone that she dropped in a ditch, we were all ready to go home. Today I made a quick trip to Police Point Park hoping to add Great Blue Heron to my year list. I didn't have to even enter the park as there were 16 in a tree right at the gate. I decided to walk around anyway and was rewarded with my lifer Herring Gull (I know...that's sad) and my first Franklin's Gull of the year. The Franklin's may be the first of the year in Alberta, but I feel like one may have been reported on the Albertabird message board last week. Either way, they will be all over in no time. Those three species put my year list at 88, that's one ahead of my pace last year. The drive back to Lethbridge tonight was fairly uneventful other than 2 Great Horned Owls on signposts. I should be able to add a couple more species without trying too hard this week and hopefully will have time for a trip to Waterton in the near future. 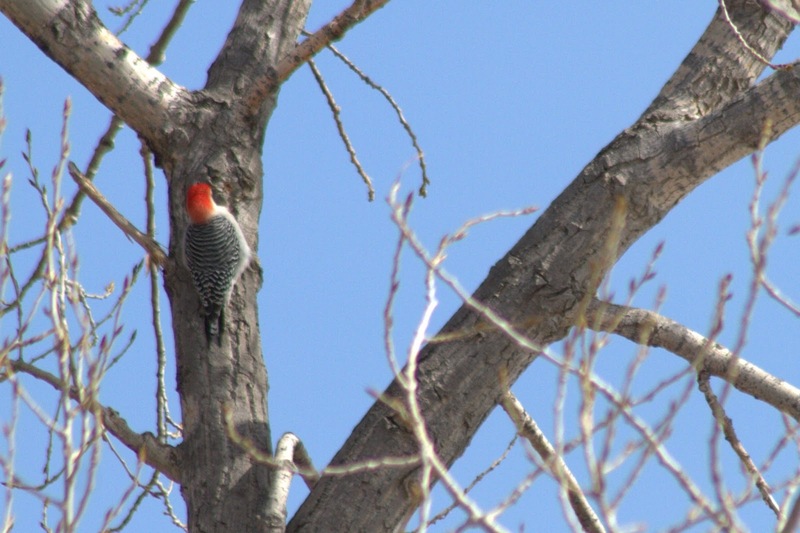 On March 19, Milt Spitzer, Phil Cram, and Mike Mulligan reported a Red-bellied Woodpecker in Etzikom Alberta, southwest of Medicine Hat. I believe that this is the third record for Alberta; the last one was in High River in the winter of 2011/2012. I tried for that bird on two separate occasions and missed it both times even though I think every other birder in Alberta got it... All that means is that I had to get this bird! If I didn't have a huge test later on in the week I would have gone the next morning but since I did I called up Mack Fai and decided to make a full day trip of it, but had to wait until Saturday March 23. That morning I met up with Mack and Kristen Mancuso. Kristen is new to the province and had a few species that she hoped to pick up. We met up around 11am because Mack needs his beauty sleep and headed on the road. About 10km north of Etzikom we picked up our first and only Northern Shrike of the day. When we got into Etzikom we drove right to the house with the feeder that the bird had been frequenting and immediately saw a woodpecker fly over our heads but none of us got a good enough view to say it was THE bird for sure. We decided to drive around the three roads in the town and eventually ended up walking even though it was bitterly cold. Kristen is from Ontario and said she was familiar with the Red-bellied's call and as we were discussing what the bird sounded like a very distinct call cut through the cold air! All three of us yelled THERE IT IS! Sure enough, there was the Red-bellied Woodpecker halfway up a tree about a block away. We all got good views and attempted to get pictures. The bird eventually flew back to the feeders and we followed in Mack's car. The owners of the house were waiving frantically in the window and pointing to the bird so we gave them the thumbs up. Mission Accomplished! Red-bellied Woodpecker, Etzikom, Alberta. Photo by Mack Fai. We decided to drive south to Pakowki Lake on the 885, but that section was frozen over so we decided to head west and see if there was open water north of the hutterite colony. On our way there a Western Meadowlark flew across the road and landed on a fence post. This was a lifer for Kristen and put on a show by singing right on cue. When we arrived at the lake there was a good number of Canada Geese, Tundra Swans, Northern Pintail, and Mallards. There were also a couple Northern Shovelers, a few American Wigeon, Common Goldeneye, half a dozen Cackling Geese and a single Male Hooded Merganser. After searching through the flock we decided to continue down the 885, drive the south side of Pakowki and head back north through Manyberries. We saw at least 12 Rough-legged Hawks, and 4 Bald Eagles, but more importantly managed to find 1 Golden Eagle and 3 Ferruginous Hawks which were also lifers for Kristen. We saw at least 5 Coyotes and herds of both Mule Deer and Pronghorn. Ferruginous Hawk on Highway 501. Photo by Mack Fai. Just before we were back in Medicine Hat we realized that we had missed on of our main targets, Sharp-tailed Grouse, so we turned down a side road that Mack and I had seen some on a few weeks before. Within a kilometer we found 7 on the road but what was more exciting was the three Porcupines in the tree next to them! Mack and Kristen watching the not so cuddly critters. We spent a few minutes taking pictures and yeah, we all touched one just to prove we could... Then we headed home and I took a well deserved nap! I'm hoping to do quite a bit of birding over Easter so stay tuned! So, maybe I'm not cut out for this blogging thing... I am going to try to keep up with this thing but I cant seem to find time! 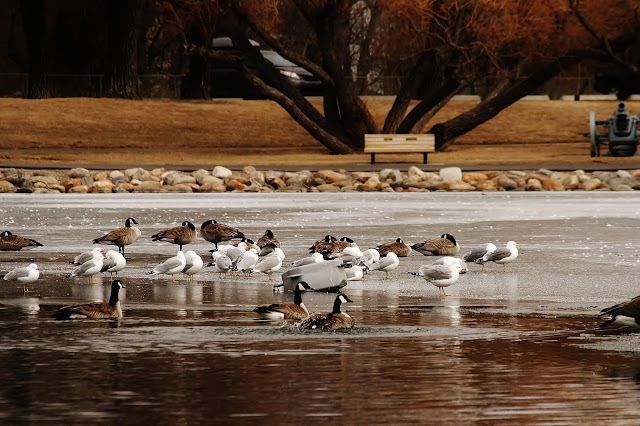 Anyway, on Sunday March 17 I decided to drive down to Milk River Ridge Reservoir to see what new waterfowl had shown up. My first decent bird was a Golden Eagle just west of Raymond but the real show happened when I arrived at the Lake! As I drove the north side of the lake it became apparent that my 200 Snow Geese had turned into thousands! Almost every field was completely covered in a white blanket, but that blanket was geese not snow! The number of Northern Pintails in the area was also staggering. There was a small patch of open water on the north side that had a few Mallards, American Wigeon, Northern Pintail, and Common Goldeneye. There were also about 10 Redhead, 4 Canvasbacks, and 1 Lesser Scaup rounding out the ducks. A flock of about 100 Tundra Swans was also present. I spent quite a bit of time looking through the flocks of geese in the field trying to pull out a Ross's Goose, but I'm either the worst or most honest birder ever...The south side of the lake had more of the same species but a flock of about 50 Lapland Longspur was a nice surprise and a new year bird for me! On my way back I saw 2 more Golden Eagles and about 5 Rough-legged Hawks. Considering the amount of raptors I was seeing, I decided to drive the back roads back to Lethbridge in search of a Gyrfalcon. I was not overly hopeful and by the time I was 90% of the way back I had pretty much given up. Then out of the corner of my eye I saw a dark blob in a stubble field to my left, but passed it off as a cat or garbage bag, or something non-birdlike, but something told me to go back and make sure. I trained my bins on the blob and there it was...GYR!!! I couldnt believe my luck, I was only 2 minutes away from the city. I watched the bird eat a Richardson's Ground Squirrel for a while but because of the distance I was unable to get any good photos. Overall it was a pretty good Sunday drive! Stay tuned for my search for a Red-bellied Woodpecker! Well I have finally decided I should try to keep a blog again so I'm just going to jump right into it. Migration has really started to pick up in Southern Alberta in the Last couple weeks. I had my first Snow Geese on February 28, two Western Meadowlarks singing South of Medicine Hat on March 2, and since then the migrant waterfowl have just kept coming. The group of Snow Geese at Milk River Ridge Reservoir have grown from 14 on Feb. 28 to well over 200 as of last weekend. Northern Pintails arrived soon after in large numbers and I saw my first wigeons of the year on March 9 which included a beautiful male Eurasian Wigeon at Ridge Reservoir. There have also been Redheads and a pair of Canvasbacks at Park Lake Provincial Park for well over a week. Today after a very frustrating Saturday at school I decided to drive past Henderson Lake to see if there was any open water on my way home. To my surprise, there was a decent amount of open water on the east side of the lake. I had driven by yesterday and it was still covered in ice. From the road I could see a good number of Canada Geese on the lake and a couple dozen gulls! I parked and quickly grabbed my bins and camera. I was a little to far to get great views of the gulls so I decided I should pick through the few ducks on the water before frustrating myself with gull ID. There were 2 male Redheads and 3 American Wigeon and my thought process while sorting through them was "canada, canada, wigeon, redhead, canada, wigeon, white-front, canada, canada wait what!?!" Out on the ice with 200 other geese was my first Alberta Greater White-fronted Goose! This species has kind of been a nemesis of mine, they rarely pass through the Lethbridge area, and when they are being seen in other parts of the province I am stuck at school. As far as I know this is the first one seen in the province this year. I spent some time taking a few half decent shots of the bird and finally got around to looking at the gulls. There were about 20 Ring-billed Gulls which were a new year bird for me with a hand full of Californias mixed in, but nothing overly exciting. After going home for a quick supper I went back out to see if anything else decided to show up on the lake, but when I arrived there was not a single bird around and someone was fishing in the spot where the birds were before. I cut my losses and drove over to Jail Lake where among the Mallards and Canada Geese were 2 more Redheads and my first Lesser Scaup of the year. I then headed down to Peenaquim Park where the only interesting birds were 3 newly arrived American Robins and 4 very noisy Killdeer. I might get a chance to go out tomorrow in between studying so stay tuned!